Nile Creek hatchery was established about 25 years ago. It has been staffed by a group of dedicated volunteers since then. Our pink salmon come from Quinsam hatchery each fall. The annual egg take occurs in late September and we pick up about one million eggs one month later. After the eggs are placed in the six stainless steel tanks we monitor water temperature daily. The alevin hatch begins in early December. By mid-February the alevin have used up their yolk sacs. They have now grown to 3 cm. and are referred to as fry. It’s now time for them to leave the hatchery and begin the two year journey into the Pacific Ocean. Pink salmon are anadromous [migrate from salt water to spawn in fresh water] and have the simplest life style of all the pacific salmon. Upon emergence pink salmon fry migrate quickly to sea and grow rapidly as they make extensive feeding migrations. After 18 months in the ocean the maturing fish return to the river of origin to spawn and die. Because of the two year life cycle pinks spawn in a particular river system in odd or even years. They are reproductively isolated from each other so the two groups have genetically different patterns. Pink salmon generally spawn in the lower sections of their native river. The spawning grounds of pinks range from central California to the region of the MacKenzie river in the Arctic. They also spawn on the coast of Asia, northward from Japan to the Siberia coast. As spawning season approaches schools of pink salmon will collect in bays and estuaries. This event occurs in mid-August to September in our area. As pinks collect near the mouths of streams they are usually seen near the surface in shallow water and often exhibit a unique leaping behaviour .Upstream migration is influenced by rising rivers tides,winds and rain. They will migrate into their spawning areas primarily during daylight hours. Ideal spawning beds consist of a uniform clean gravel beds on riffles. Depth of water and stream velocity are also factors. Pink salmon undergo a series of major changes as they approach readiness to spawn. One salmon researcher pointed out that these changes are so great that if one was not cognizant of the transformation……. One would not consider them the same species. The male develops an enormous hump on his back[ hence the nickname humpy] , a greatly enlarged head and large teeth on both jaws. Females undergo only minor changes in appearance, mainly darkening skin with irregular black patches. These changes occur in 4 to 6 weeks as the fish mill about in estuaries awaiting ideal spawning conditions. Once a site has been chosen for the redd or spawning bed, the female does the major work of excavation while the male keeps guard!! Throughout the course of nest building a female will move about 1/3 cubic meter of streambed material. 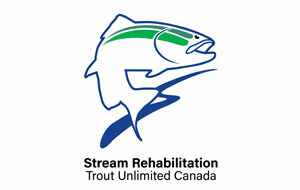 The pink salmon redd is 60 to 150 cm. wide by 100 to 250cm. in length. Egg deposition occurs mainly at dusk and over nite. The female will lay one to two thousand eggs but the number varies considerable. After the eggs have been deposited in the redd and fertilized the female resumes digging movements just upstream. The loose gravel is carried by the current to cover the freshly laid eggs. In this way she will dig one to four redds. After spawning she remains to protect the redd area from other females disturbing her eggs. A protracted spawning season may lead to disruption of previously deposited eggs. The mortality of pink salmon eggs depends on three environmental factors: supply of dissolved oxygen, stability of spawning beds and freezing temperatures. The rate of development in the eggs depends on water temperature. Eggs hatch around 530 to 610 ATU’s. Accumulated Thermal Units is calculated by adding daily water temperature in degrees celsius from date of fertilization. Emergence of fry occurs at 900 to 980 ATU. 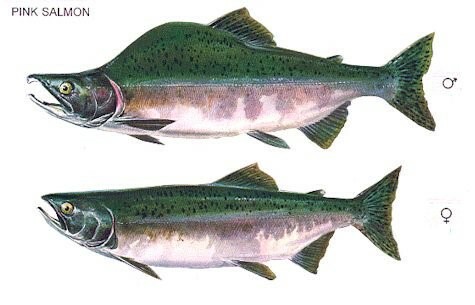 Pink salmon emerge predominantly at night, a behaviour developed to protect them from predators.A key moment for the pink salmon fry occurs when they emerge from the gravel and move to open water. The tiny fry swallow air to fill their swim bladder. This allows them to achieve neutral buoyancy in their water environment so they can manuver much more easily. Later in spring we will highlight Fry Migration,early sea life, off shore migration and the high sea phase.